Ohio Ballot Initiative That Aims To Lower Drug Prices Goes To Voters : Shots - Health News Ohio voters are being asked by a ballot initiative to consider making a law that would require the state to pay no more for prescription drugs than the federal Department of Veterans Affairs does. 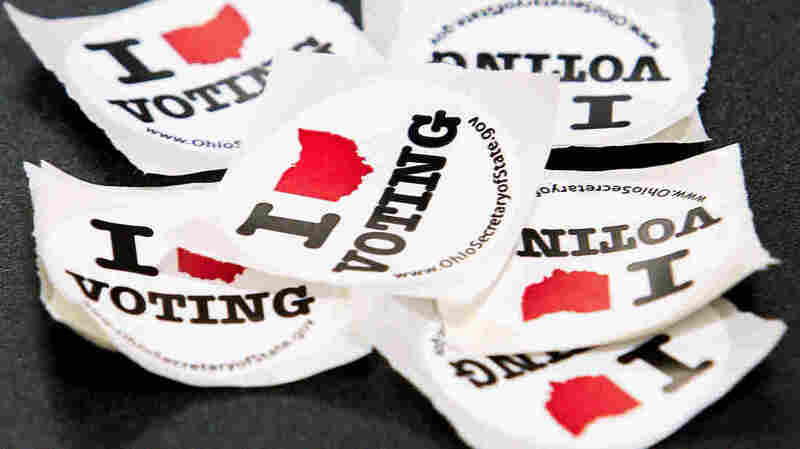 When Ohio voters head to the polls Tuesday, they'll be able to weigh in on a ballot measure that aims to get better drug prices for state programs. Lawmakers in the nation's capital have yet to grapple with rising drug costs. But in Ohio, voters are being asked by a ballot initiative to consider making a law that would require the state to pay no more for prescription drugs than the federal Department of Veterans Affairs does. The Drug Price Relief Act, better known as Ohio Issue 2, has been promoted and pilloried in a dizzying crush of robocalls, direct mail and ads on TV and radio. Opponents say the law would be impossible to implement, could limit patients' access to medicines and wouldn't necessarily save money. Proponents are selling the initiative as a form of rebellion that could save millions of dollars in an era of health care anxiety. And in the run-up to Election Day, voters say it's difficult to make sense of it all. Sean Hundley, 30, works at a coffee shop in the trendy Short North neighborhood in Columbus, the state capital. He is covered by Medicaid and said he has seen plenty of advertising from both sides, but he can't figure out who is telling the truth. "Everything they say, not knowing who to trust — it would just lead me not to cast a vote," he said. This reaction highlights one of the difficulties of asking voters to sort out such a complex issue. But what Ohio voters decide could have implications well beyond the state's borders. In the absence of federal action, some states have begun taking legislative steps to lessen the toll of rising drug costs on their budgets. If Issue 2 passes in Ohio on Tuesday, the ballot-question approach may gain momentum. Advocates in South Dakota and the District of Columbia are already pushing for similar drug pricing initiatives in the November 2018 election. That is part of the reason why the Ohio initiative has drawn attention and spending from outside the state. Supporters have raised more than $14 million, with most of that money coming from the California-based AIDS Healthcare Foundation. Opponents, bankrolled by the pharmaceutical industry, have raised $58 million. People attending a water aerobics class at a suburban Cincinnati gym in September said they had been trying to to figure out how to vote on the ballot initiative. They also said they were fed up with all of the campaign noise. The exercisers — mostly women of retirement age — even peppered a reporter with questions: Do you understand it? Can you explain it to me? If enacted, Issue 2 would prohibit state programs, such as Medicaid and state employee health plans, from paying more for a drug than the federal Veterans Health Administration does. The Department of Veterans Affairs receives heavily reduced prices for prescription drugs. But analysts are divided over whether the approach would work in Ohio or how much budget relief it could provide. The nonpartisan Ohio Office of Budget and Management said it's unclear whether the change would actually save any money and, if so, how much. Supporters include Vermont Sen. Bernie Sanders and Ohio's former Republican Party chairman Matt Borges. They counter that their calculations indicate savings of about $400 million from lower prices. Those concessions, they say, are why drug companies have spent so much fighting the initiative. "Our opponents say it's unworkable or — they've created a word — 'unimplementable.' We believe it will work," said Dennis Willard, a spokesman for the Yes on Issue 2 campaign. Critics worry Issue 2 would be nearly impossible to enforce. For one thing, the VA's final discounts are deemed proprietary and are kept secret. For another, it's unclear which state agencies would be included under the initiative. In addition, the state's Medicaid program already receives discounts from drug companies. Unlike the VA, though, federal law requires it to cover the vast majority of drugs, making price negotiation more difficult. The VA runs a tight preferred list of drugs, paying for some and not others. "You can't get the VA prices if you don't do VA things," said Dr. Walid Gellad, co-director of the Center for Pharmaceutical Policy and Prescribing at the University of Pittsburgh. "To just say, 'We're not going to pay more than the VA' is difficult." But those are nuances that are tough to explain in a radio spot or on a mailed flyer. The dueling media blitz is leaving many Ohio voters at a loss. Take Barbara Herr, a 64-year-old paralegal. She is a lifelong Democrat, she said, and in some ways is the issue's target voter: a self-described political junkie who voted for Sanders in his presidential campaign for the Democratic nomination. She has a shellfish allergy, so she carries an EpiPen — a medication whose price hikes sparked national scorn and a congressional inquiry. Even though the ballot question would not likely directly affect her medication spending, she thinks prescription drug pricing is a "grave concern" and must be addressed. So far, though, she is a likely "no" vote. "It just is very confusing," Herr said, reflecting on her impending Election Day decision. "I have read quite a bit about it, and I don't think it achieves much of anything."